Look at All the Product Lines Available! You are here: Home / Nature’s Pharmacy / Look at All the Product Lines Available! There are two sets of product lines that we can make available to you. The first set includes those product lines that we stock on our shelves. You will also find several of these product lines in our on line stores. The second set is available via special order. 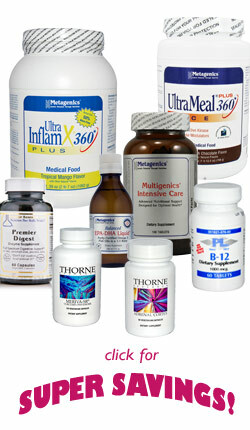 We currently carry select items from the following product lines at the clinic on our shelves. A complete selection of items from those lines shown in color may also be found in our on line stores accessible in the sidebar to this page. Otherwise, we can typically make the complete product line available to you via special order. Please contact our front desk if you would like help obtaining an item. Click here for more information about our: online stores. We do not stock the following product lines but we can supply most items that they include at competitive market prices if you request them. Please contact our front desk if you would like help obtaining anything.